There aren’t many heavyweight politicians today who can begin a speech with a fairly staid quotation. But it’s the sort of beginning to a Michael Gove speech that we can expect from the scholarly Michael Gove, the Education Secretary. So, in a speech to the Independent Academies Association (IAA) he used a story about Stanley Baldwin to introduce the subjects of knowledge and learning…and the lengths that some people go to disguise their learning. This bias against knowledge manifested itself most recently when the otherwise saintly inventor Sir James Dyson had a crack at people who want to go to university to learn French lesbian poetry rather than applying themselves to matters technical. It’s like professing a love of cookery – hymning the beauty of perfectly baked souffles or rhapsodising over richly unguent risottos – and then saying the most important thing about food is checking the calorie count in every mouthful. Isn’t an obsession with measurement the enemy of enjoyment, the desire to assess and examine the death of learning for its own sake? Exams matter because motivation matters. Humans are hard-wired to seek out challenges. And our self-belief grows as we clear challenges we once thought beyond us. With external testing there is no opportunity for such bias – the soft bigotry of low expectations – and tests show ethnic minority students performing better. So external tests are not only a way of levelling the playing field for children of all backgrounds they are a solvent of prejudice. Some say it is unfair to hold disadvantaged children to rigorous standards. I say it is discrimination to require anything less–the soft bigotry of low expectations. In terms of structure the Education Secretary had seven reasons to support exams. An odd choice of number. Far from memorable. He didn’t make much attempt to keep referring to the number of reasons…at times it was certainly hard to establish which reason he was discussing. And that brings me to my final argument. Schools that take tests seriously take students seriously. Schools that want exam success want their students to succeed. And schools that pursue academic excellence give their students the potential to beat the world. 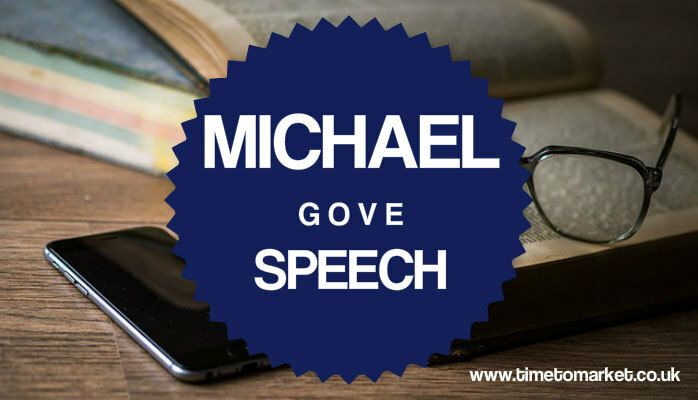 And that was that, a convincing end to another fine Michael Gove speech. You can read plenty of public speaking tips with our series of tips, suggestions and hints. And, of course, when you are ready to give your public speaking skills a real boost, you can always consider a public speaking course or public speaking coaching. Please don’t hesitate to get in contact whenever the time is right.